Solar cells convert sunlight directly into electricity and are being used increasingly for more sustainable power applications than ever, from desk calculators and iPod chargers, to powering satellites, space ships, power generators, and solar lighting. Solar cells are composed of semiconducting silicone materials similar to those used in computer chips. When sunlight is absorbed by these materials, the solar energy knocks electrons loose from their atoms, allowing the electrons to flow through the material, thereby producing electric current. The process of converting light (photons) to electricity (voltage) is call the photovoltaic (PV) effect. To learn more about PV technology, visit HowStuffWorks.com for comprehensive introduction to the subject. 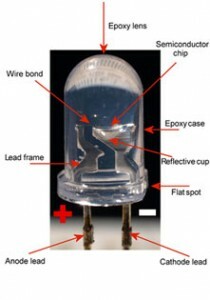 Light emitting diodes, commonly called “LEDs” have been in existence for many years. A product of accidental discovery, the technology was immediately recognized as a revolution in lighting, and has since transverse many technological fields in thousands of different implementations. LED’s are utilized for digital lighting, for transmitting information via remote control, as indicators on virtually all electronics, are even on the next generation of high definition screens. They are a consistent part of all of our lives. At virtually every point in your day, from turning to your alarm clock, to checking your watch, to stopping at a traffic sign or sitting in front of your computer, you are utilizing LED technology. The main advantage is efficiency. LEDs are a tiny light bulbs that fit easily into an electrical circuit, but unlike ordinary incandescent bulbs, they don’t have a filament that will burn out, a gas that fails or pollutes, and they don’t get especially hot. Traditional bulbs burns off 98% of it’s energy in heat production. LED’s are illuminated solely by the movement of electrons in a semiconductor material, and they last just as long as a standard transistor. (From 100,000 to 120,000 hours of operation). They generate little to no heat, comparatively speaking. The overwhelming majority of energy used for the emission of light. Until recently, LEDs were too expensive to use for most lighting applications because they’re built around advanced semiconductor material. 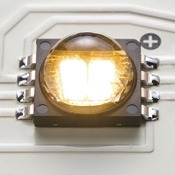 The price of semiconductor devices has plummeted over the past decade making LEDs the number one cost-effective lighting option for a wide range of situations. In many municipalities, LED lighting has already been mandated, and within the decade LEDs will be the dominant lighting technology in landscapes across the entire world. Download the LED Application Series: Using LEDs to Their Best Advantage infosheet published by the U.S. Department of Energy to learn about the various advantages and applications for LED lighting. The ultra-capacitor technology replaces the conventional battery, and advances the next generation of energy efficiency and sustainability. Utilizing a dry energy medium, the capacitor is able to continuously perform for an estimated average of 12 years or more. The LightMark™ and LightDeco™ technology will not require replacement of consumables for the foreseeable future, while similar products which are battery based, consistently suffer degradation of performance within 0-3 years. Ultra-Capacitors charge rapidly, allowing for storage of large amounts of energy over short time spans. This energy can then be regulated while released to enhance prolonged operation. SolarPath is able to harvest sunlight at high efficiency levels, thereby harnessing energy in any weather condition, as opposed to batteries in which a fast charging algorithm further reduces their lifespan. Ultra-Capacitor technology creates far reaching improvements in temperature resistance. degrade at 50% of that range. As a green company, the eco-friendly challenge of energy storage is at the forefront of our engineering goals. other corrosive materials for use in ground applications. Additionally, they are easily and cheaply recycled. The VibraProof™ technology prevents micro-flexing and micro-fracture of the solar panels and circuitry, as well as provide additional protection to the LED array. Road vibrations are a constant and serious factor in the environment in which surface based light emitting devices are installed. Delicate electronics, including circuitry, photovoltaic, energy sources, and integration mediums require maximum protections to ensure long-term operation and efficiency. SolarPath is the only company addressing this challenging dynamic through the development of the VibraProof™ technology. The VibraProof™ technology ensures superior longevity, and extended performance, by creating a “floating safe-zone” for the electronic components. There has been a lot of confusion as to what constitutes “light” and how various man made “artificial lighting sources” affect human’s ability to see in the dark. Researchers at the University of California, Berkeley have been working on a “cross-over chart” to compare various lighting of different light spectrums and how it relates that to what “the eye” can perceive, given one source as opposed to another. This is to enable lighting design engineers to call out “adequate lighting” that takes into consideration color temperature instead of simply, the physical output measured in lumens, lux, or candlepower. Currently only half of the light equation is being considered. Full-spectrum white light, when reflected off objects makes the objects appear brighter and more visible to the human eye at greater distances than monochromatic HPS (high pressure sodium) or LPS (low pressure sodium) light sources measured at identical lumens (or candlepower) outputs. Measuring any light by its lumen output simply depicts what the lamp can produce at its source. Doing so, would be the same as measuring the brightness of any light source by using the lamp’s electrical current consumption in watts to describe the degree of brightness of any lamp. This of course, is not a good indication of its lighting performance. The most important property in lighting is how much light reaches an object (Reflected light bouncing off an object.) Not how much light is being generated at the source. Hence what affects the perception of “reflected light” makes it more important in the majority of lighting applications than the lamp’s physical light output if viewed directly. The degree of visual acuity and how it affects perception is influenced by the color spectrum the object is viewed at. This phenomenon is referred to as scoptopic vision. Most people are not aware that the color of light is a factor of “color temperature” measured as “degrees of Kelvin” as in nature’s full color spectrum light – the sun. Natural sunlight at noon has a color temperature of 5,250 degrees Kelvin. In the morning or at sunset when the sun rays have to penetrate more air in the atmosphere as it is angled low on the horizon, it appears red or orange. This is measured at the low color spectrum of around 1,000 to 2,000 degrees Kelvin. Hence this is the reason why humans have more difficulty seeing details whilst driving at dusk when light is reduced & reddish in color (monochromatic) as compared to noon-time sun when the light is rendered in “pure” white. When viewing printed colors, it is also more accurate viewing it at noon, than say early morning where the light is hinging towards the blue spectrum or evening in towards the red. Hence if an “artificial light” can be engineered to emulate that of natural sunlight, then what will be perceived is naturally more visible – thus making the light “appear brighter” when in actual fact if measured physically using a photometer, produces less lumens than a monochromatic light at higher lumens. This is a result of the cones & rods in the human eye that aligns itself better to absorb more details at the mean temperature produced by the sun – natural light. The converse of such would be nocturnal animals whose eyes are designed to view details in low light and in the blue spectrum. Last but not least, with higher lumen outputs, glare is also generated and such is counter-productive to “visual acuity.” It even becomes a hazard when driving at night as “glare” reduces the amount of light that enters the eyes of the driver as the iris of the eye automatically closes to a smaller aperture to protect itself hence farther reducing visual acuity. This is counterproductive – despite the fact that it appears to be “brighter” on paper because of the higher lumen output; you are not seeing more but less. This is a problem reflected in the current crop of conventional street lighting using HPS (high pressure sodium bulb) that produces light at 2,200 degrees K. or SOX (low pressure sodium) lamps at only 1,700 degrees. This phenomenon is still being studied by lighting researchers in order that visual acuity measurements can be developed and used instead of simply relying on Lumens to determine what is “adequate lighting.” Few lighting engineers around the world are even aware of such a phenomenon. They are still measuring light by using the old method; solely applying physical light output (i.e. lumens, lux or candlepower) without taking light frequencies into consideration for any specific application. Until a “cross-over chart” can be developed to factor in color temperature against physical light output, most lighting engineers would still be essentially designing “lighting applications” somewhat in the dark. The Illuminating Engineering Society of North America, (IESNA, or IES) in its current IES publications provides recommended illumination levels for outdoor lighting. We summarize some of these recommendations below. It is important to note that these values are recommendations, not standards. Standards are set at the federal, state, county, or community level. We give below a summary of the lighting illuminance levels in foot-candles, as that is the most common unit used in the United States. However, lux is the preferred international unit, and the IES does officially recommend its use in the United States. A level of ten lux is about one foot-candle (10.76 lx = 1 fc, exactly). The Illuminating Engineering Society of North America, (IESNA, or IES) in its current IES publications provides recommended illumination levels for outdoor lighting. We summarize some of these recommendations below. It is important to note that these values are recommendations, not standards. Standards are set at the federal, state, county, or community level. We give below a summary of the lighting illuminance levels in foot-candles, as that is the most common unit used in the United States. However, lux is the preferred international unit, and the IES does officially recommend its use in the United States. A level of ten lux is about one foot-candle (10.76 lx = 1 fc, exactly). IES also states that the “Low” values are appropriate wherever there is a requirement to maintain security at any time in areas where there is a low level of nighttime activity. Insolation is a measure of solar radiation energy received on a given surface area in a given time. The insolation into a surface is largest when the surface directly faces the Sun. As the angle increases between the direction normal to the surface and the direction of the rays of sunlight, the insolation is reduced in proportion to the cosine of the angle. This is known in optics as Lambert’s cosine law. This ‘projection effect’ is the main reason why the polar regions are much colder than equatorial regions on Earth. On an annual average the poles receive less insolation than does the equator, because at the poles the Earth’s surface is angled away from the Sun. Use the map below to identify the yearly average solar Insolation levels in your area. The IDA has published a number of articles and helpful guides and a quarterly newsletter highlighting the leading topics in dark sky preservation. This is in addition to award winning and highly popular meetings and events plus a number of programs and features, such as the Fixture Seal of Approval Program (FSA) or the International Dark Sky Communities (IDSC), Parks (IDSP), and Reserves (IDSR) Programs. IDA incorporated in 1988 as a tax-exempt non-profit organization operating exclusively for educational and scientific purposes. SolarPath HighLight Series ML fixtures have been officially approved by the IDA as DarkSky compliant meaning they do not cause light pollution. click here to visit the SolarPath products page on the IDA website. Photovoltaic technology developments and Solar news. News and information from the Renewable Energy world. Variety of useful informative links pertaining renewable energies.